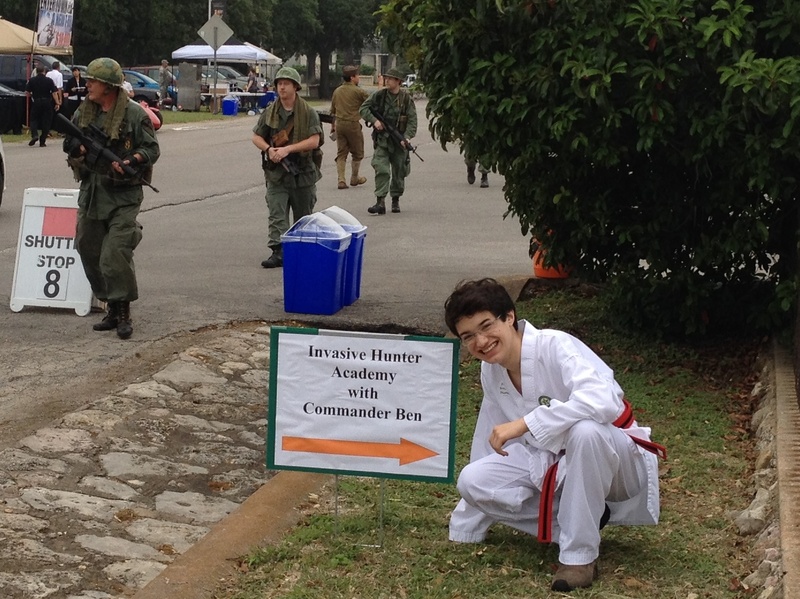 This spring I was honored to be invited to bring my Invasive Hunter Academy to 2014 American Heroes Days at Camp Mabry in Austin, Texas. 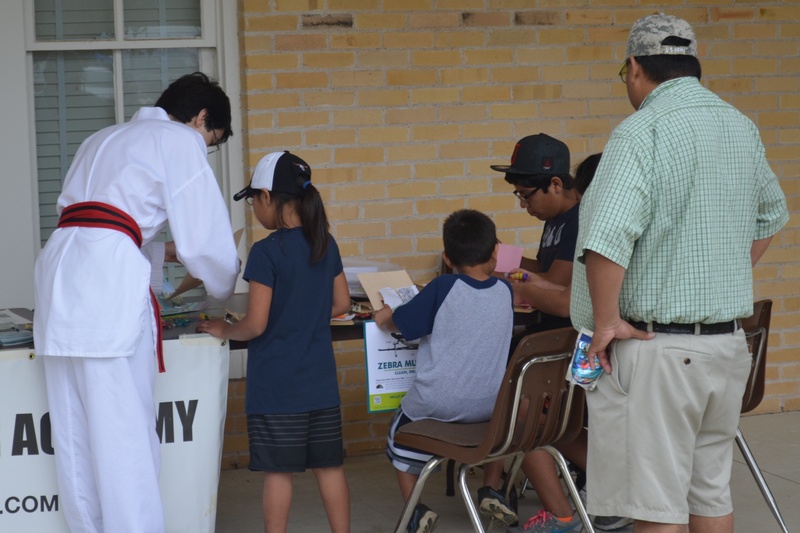 This special weekend included the Muster Days event, and the academy was part of the Texas environmental section with activities and booths for kids and attendees. 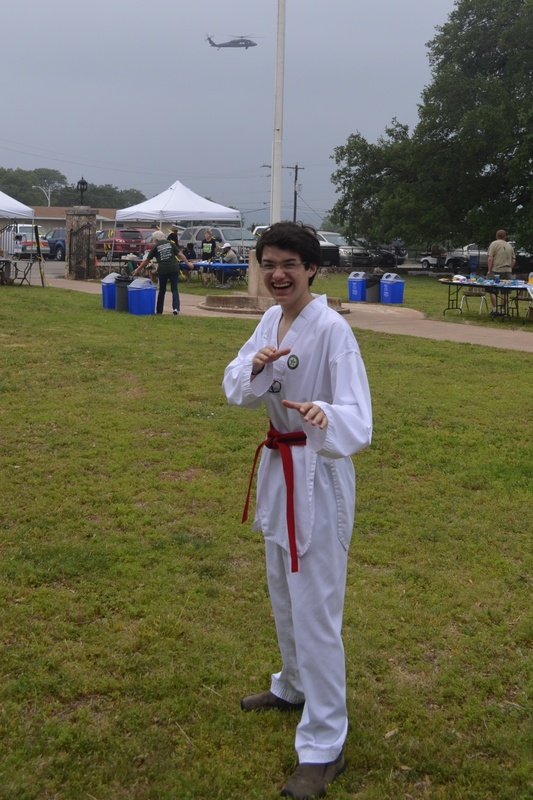 In addition to the Texas ecosystem activities, there were lots of military displays and reenactments, including a WWII battle. 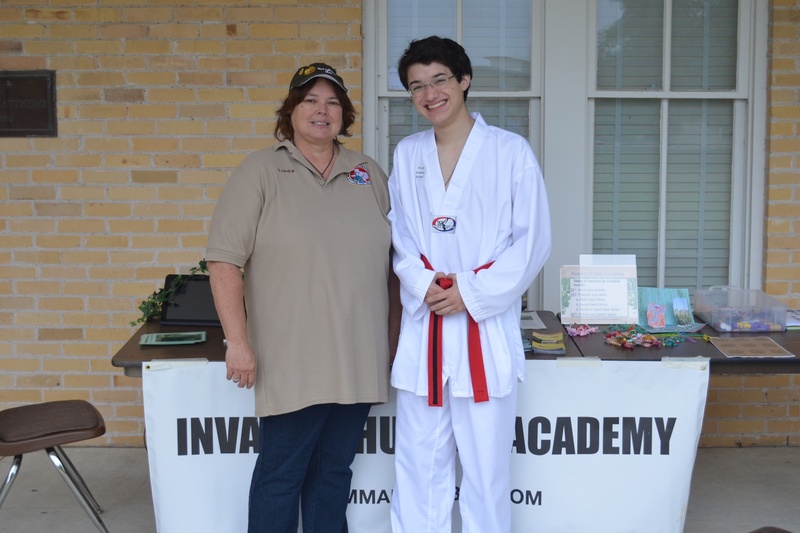 I always enjoy teaching kids about Texas invasive species through the Invasive Hunter Academy’s fun activities. 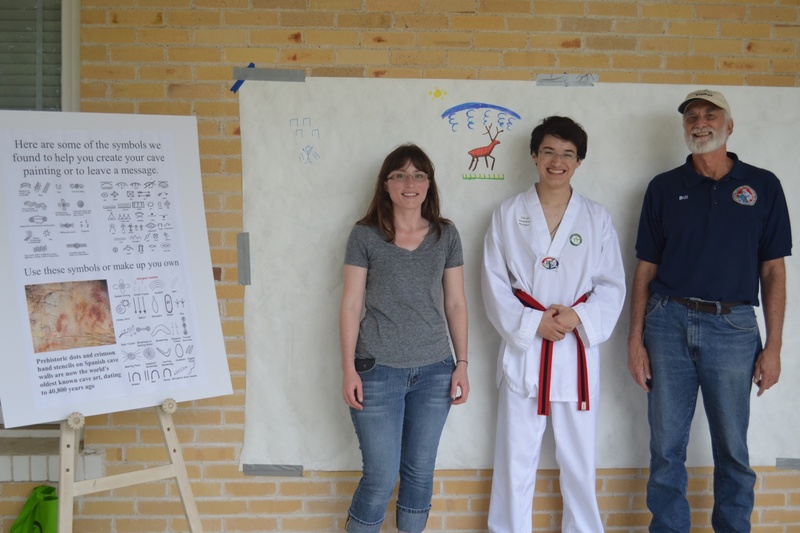 This was the third academy event that I held this spring, including taking the academy on the road to Austin school kids for Earth Day at St. Edwards University. 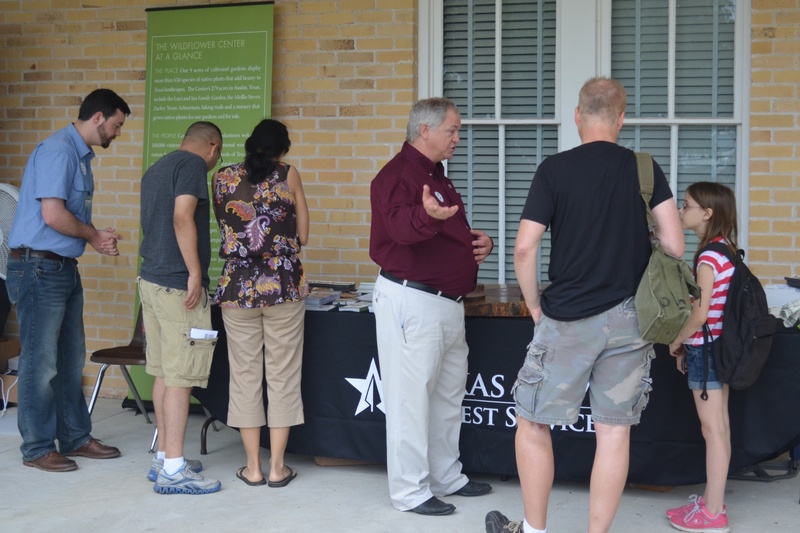 Justin Bush, Commander Ben, and Mike Murphrey in front of the Texas A&M Forest Service table. I’m holding my “May the forest be with you” bookmark. 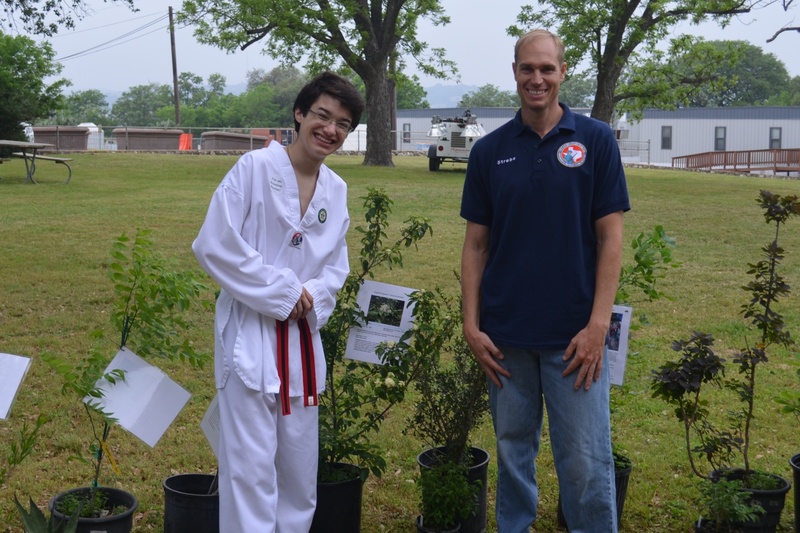 Mr. Justin Bush, Invasive Species Coordinator for the Lady Bird Johnson Wildflower Center, and Mr. Mike Murphrey, Forester with the Texas A&M Forest Service, teamed up to talk about native Texas plants and trees. Mr. Bush is a wonderful friend and great speaker. He has traveled across the state giving talks and workshops to train citizen scientists how to spot invasive species. 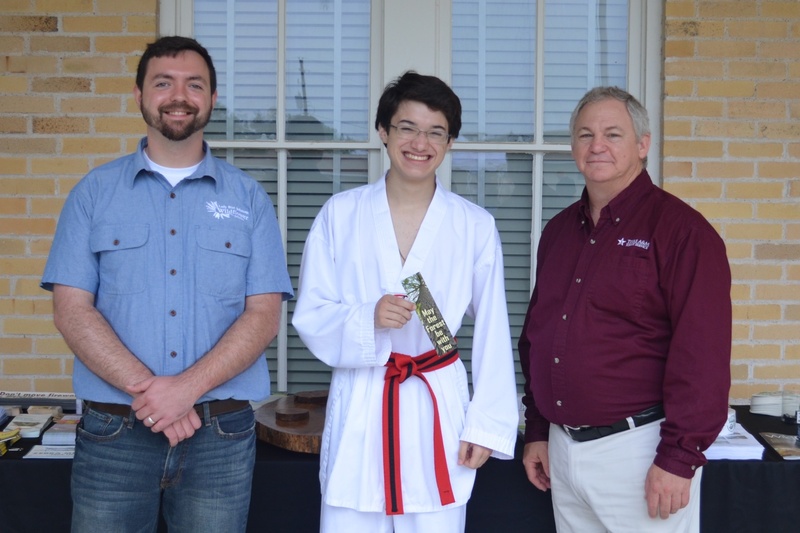 He gave me a bunch of Wildflower Center and invasive species brochures to hand out at my academy events. (Thanks, Justin!) Be sure to sign up for the iWire newsletter to stay in touch with the latest Texas invasive species news. 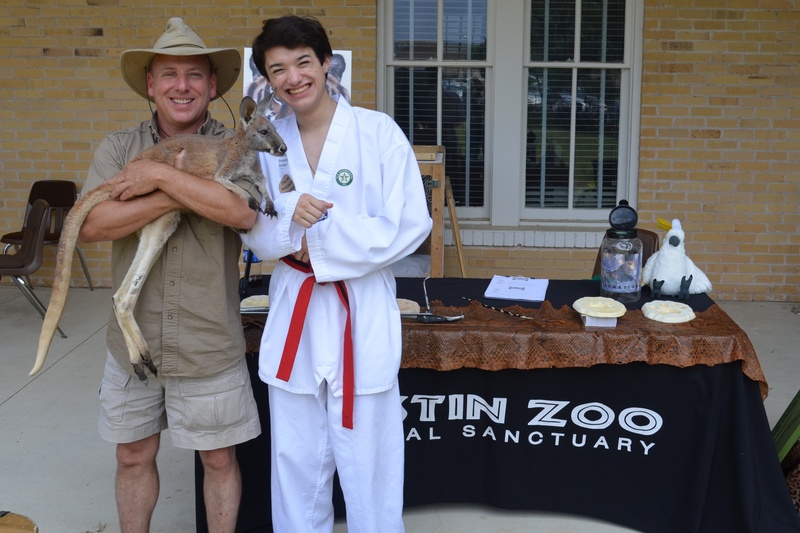 Safari Greg with the Austin Zoo brought a lot of animals, including an adorable tortoise and this cute baby kangaroo, to show kids on Sunday. 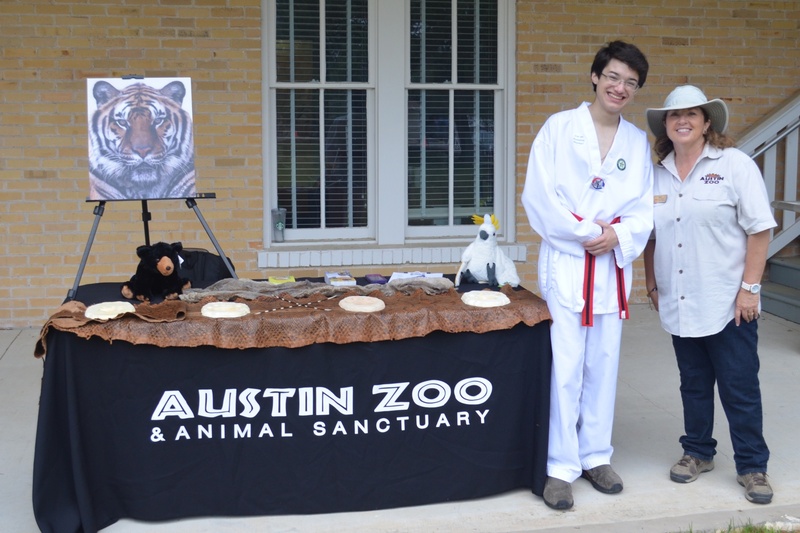 The Austin Zoo helps many animals in need, rescuing and rehabilitating them. I had fun visiting their southwest Austin location when I was younger. 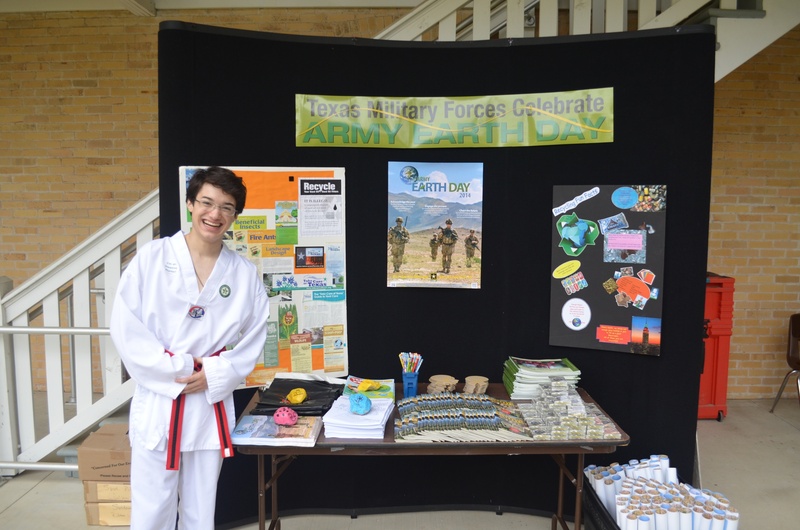 Notice those large colored rocks to help hold down the papers in the Army Earth Day booth in case of wind. That’s a great idea! 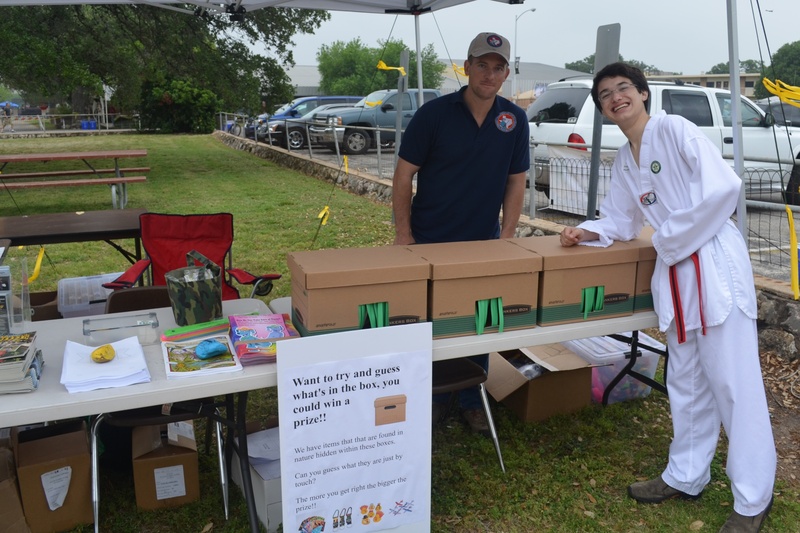 I used large binder clips to help keep my academy materials from blowing away during the 2014 Milam County Nature festival. 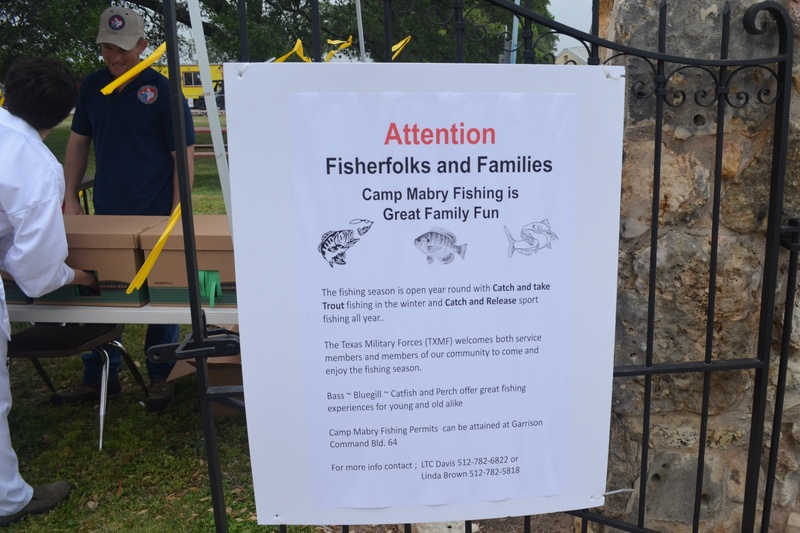 Did you know you can fish at Camp Mabry? I didn’t, but it’s true! 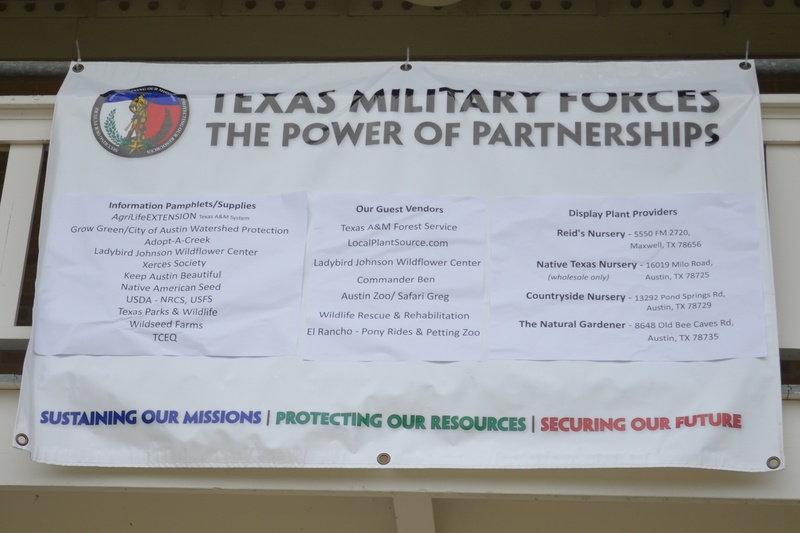 Texas Military Forces: The Power of Partnerships. 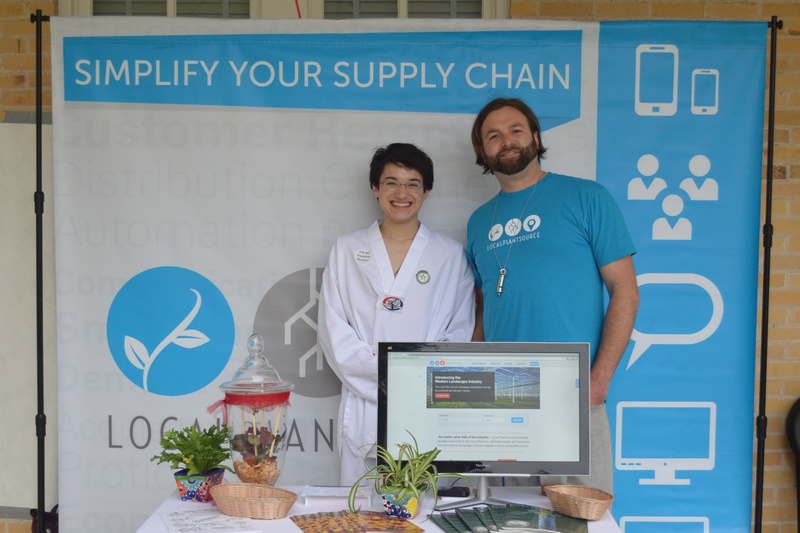 What an honor to be listed with a lot of great nature organizations! Where did that Sherman Tank go? It was here just a minute ago. 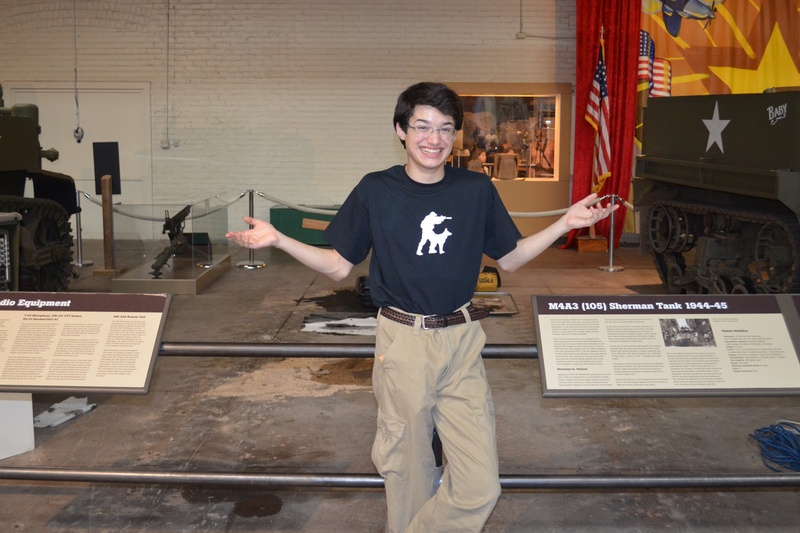 The Sherman Tank that I took a picture with at the Texas Military Forces Museum was gone! But it wasn’t MIA. 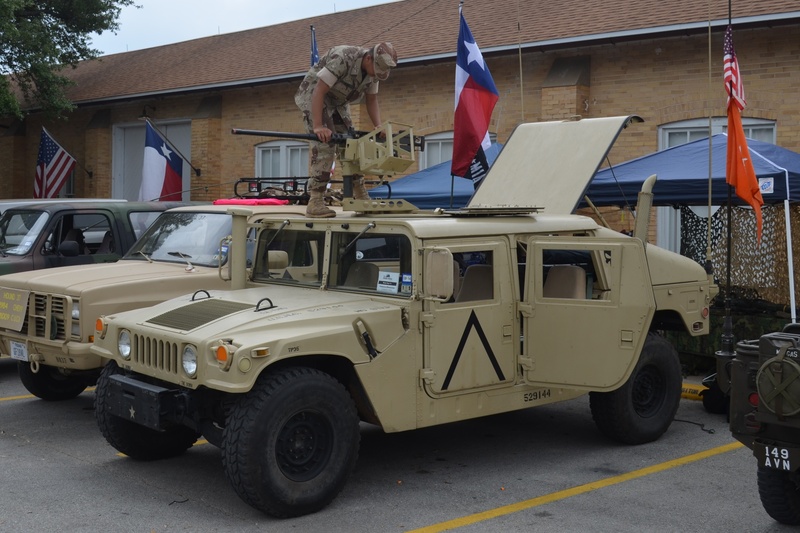 Instead, it was leading the charge during the WWII battle reenactment during Muster Days at Camp Mabry. The Axis powers were no match! I really love dogs, so it was great to find a booth for the canine corps and the police force dogs. These dogs are great because they can enter buildings to quickly find threats or hostages. They really help to protect our soldiers, and I got a neat t-shirt from them. My thanks to Dr. Linda Brown, Natural Resource Program Manager with the Texas Military Department, for inviting me to the event. I met Dr. Brown during the 2014 Texas Invasive Plant and Pest conference in Port Aransas earlier this year.